Histories of the National Mall | Queen Elizabeth visits the Smithsonian "Castle"
“Queen Elizabeth visits the Smithsonian "Castle",” Histories of the National Mall, accessed April 22, 2019, http://mallhistory.org/items/show/215. In July of 1976 Queen Elizabeth II came to the US to commemorate the Bicentennial of the American Revolution. One of her stops while in Washington, DC, was the Smithsonian Institution Building, or the “Castle,” and the National Mall. The night before, her Majesty had been an honored guest at a state dinner in the Rose Garden within President’s Park, hosted by President Gerald Ford. 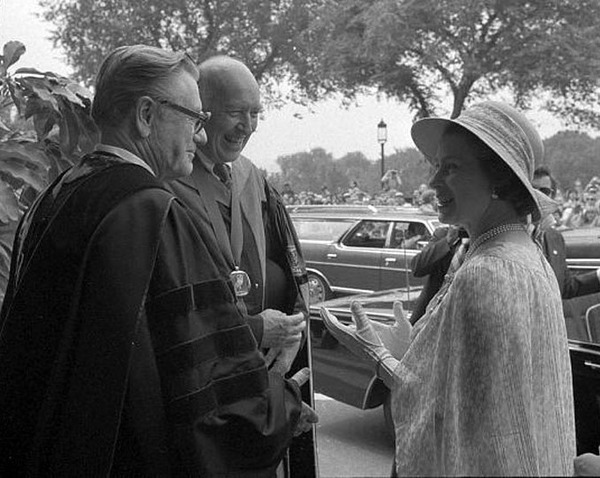 At the Castle, she was greeted by the Smithsonian's Vice President, Nelson Rockefeller, and Secretary S. Dillon Ripley.